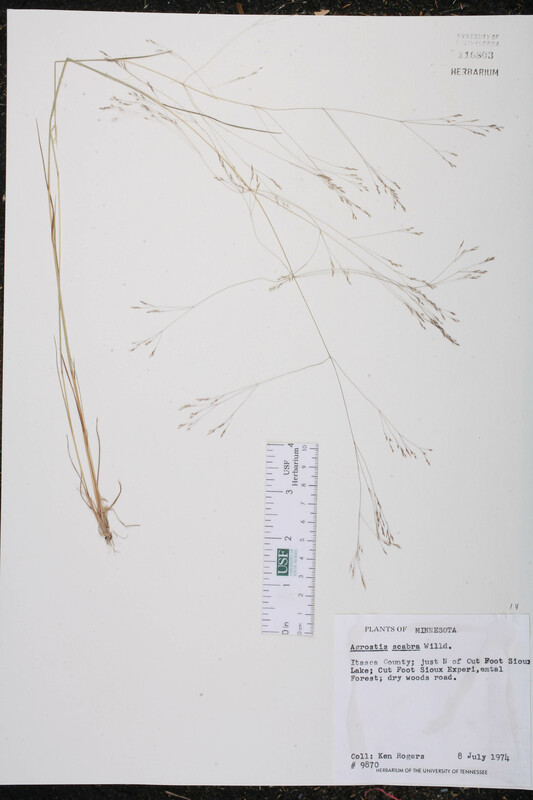 Citation AGROSTIS SCABRA Willdenow, Sp. Pl. 1: 370. 1797. Agrostis hyemalis var. 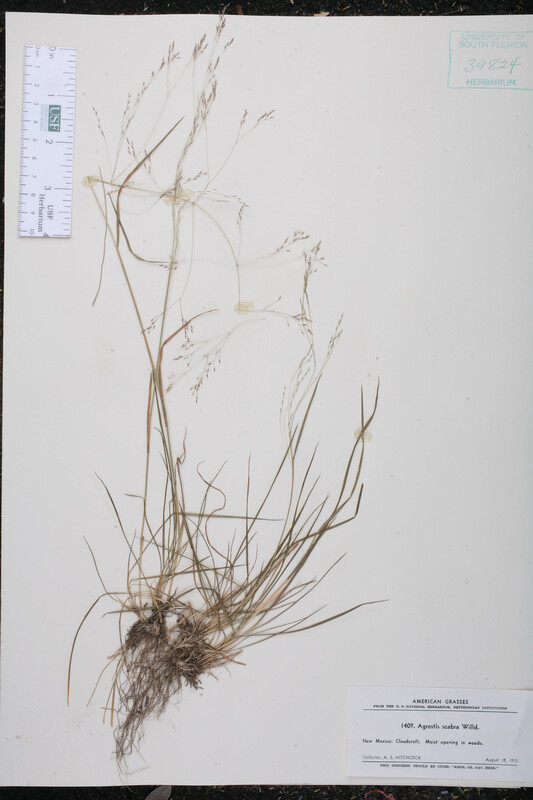 scabra Agrostis hyemalis (Walter) Britton et al., var. 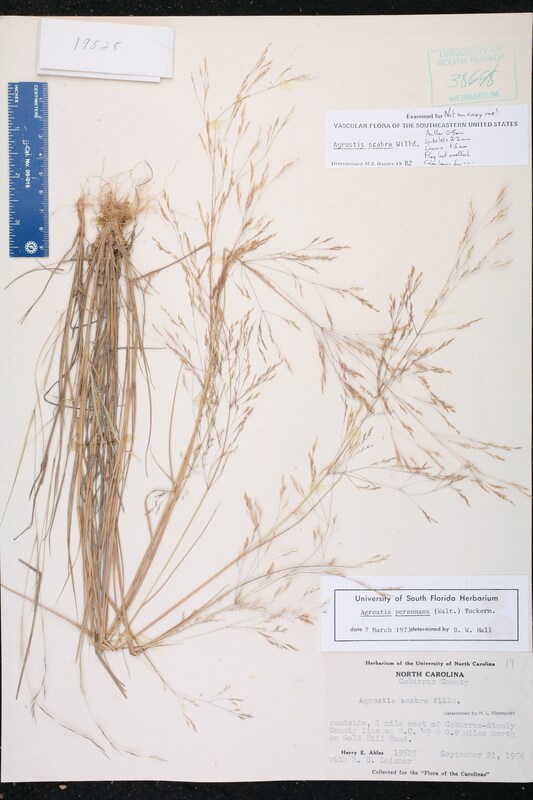 scabra (Willdenow) H. Blomquist, Grasses N. Carolina 82. 1948. 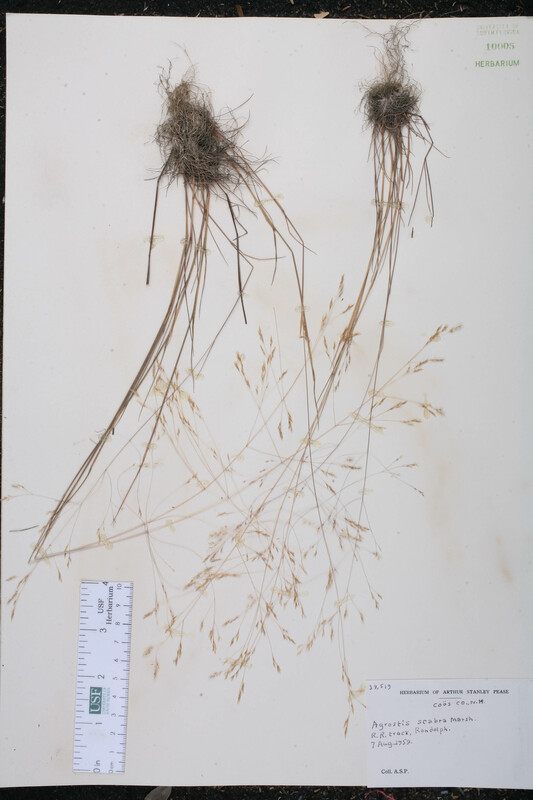 BASIONYM: Agrostis scabra Willdenow 1797. Agrostis laxiflora var. scabra Agrostis laxiflora Richardson, var. scabra (Willdenow) Torrey, Fl. New York 2: 442. 1843. 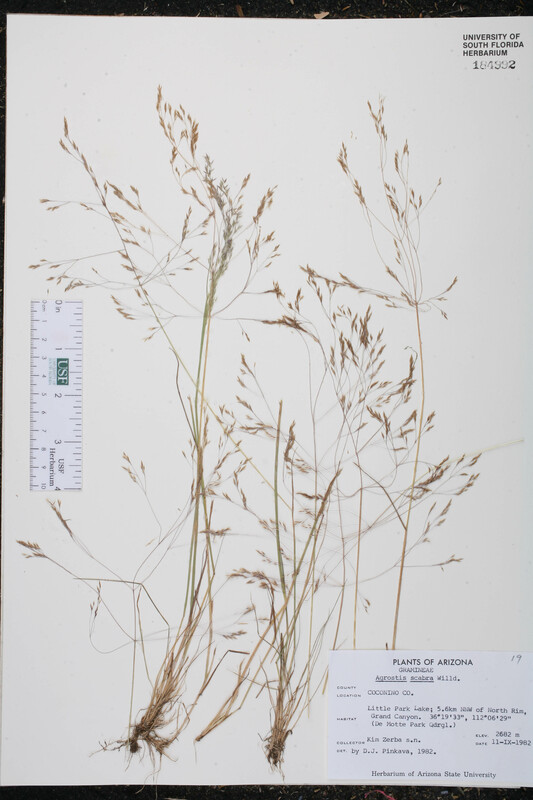 BASIONYM: Agrostis scabra Willdenow 1797. Trichodium scabrum Trichodium scabrum (Willdenow) Muhlenberg, Cat. Pl. Amer. Sept. 10. 1813. 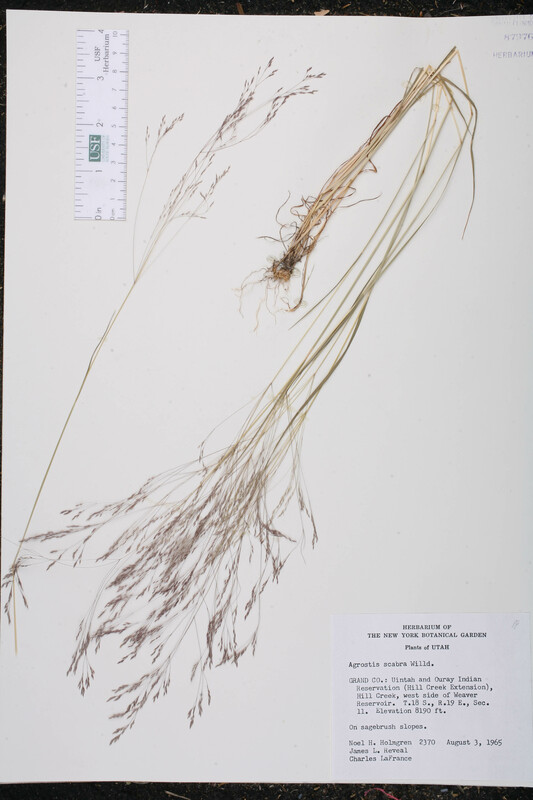 BASIONYM: Agrostis scabra Willdenow 1797. Vilfa scabra Vilfa scabra (Willdenow) Palisot de Beauvois, Ess. Agrostogr. 16, 182. 1812. 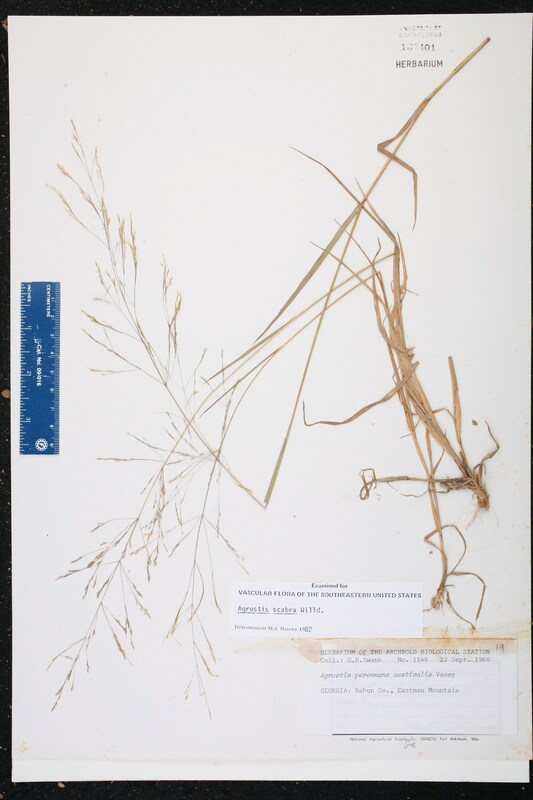 BASIONYM: Agrostis scabra Willdenow 1797. 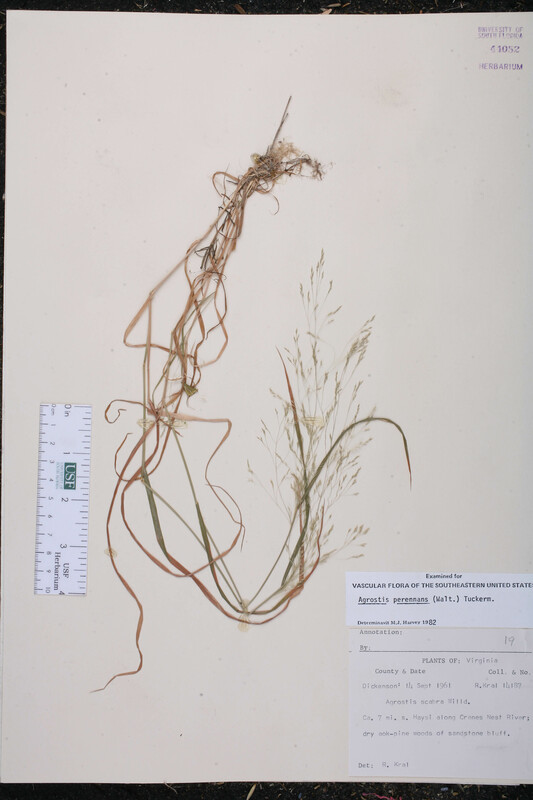 Agrostis geminata Agrostis geminata Trinius, Gram. Unifl. Sesquifl. 207. 1824. TYPE: ALASKA: Unalaska Island, s.d., Eschcholtz s.n. (holotype: LE). Agrostis geminata forma exaristata Agrostis geminata Trinius, forma exaristata Fernald, Rhodora 35: 211. 1933. TYPE: CANADA: Quebec: Gaspé Co.: Small lake back of North Fork Camp, North Fork of Madeleine River, 12 Aug 1923, Fernald et al. 25485 (holotype: GH). 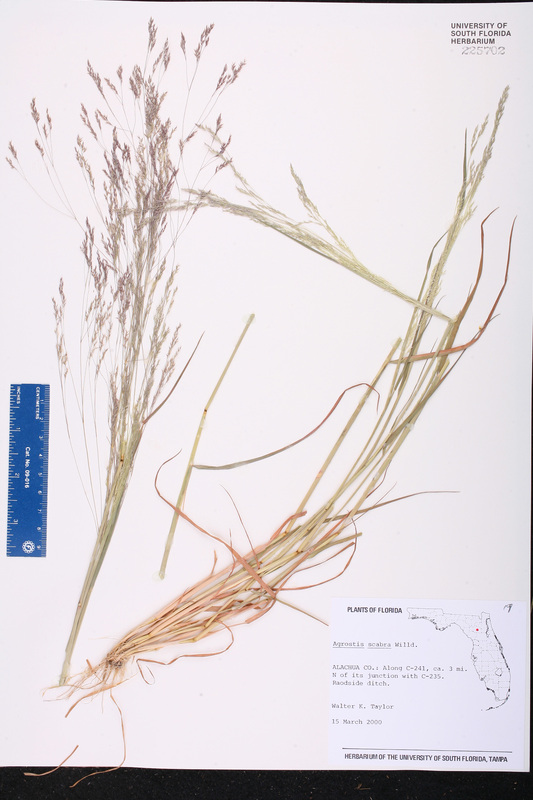 Agrostis hyemalis forma exaristata Agrostis hyemalis (Linnaeus) Britton et al., forma exaristata (Fernald) Scoggan, Fl. Canada 1: 51. 1978. 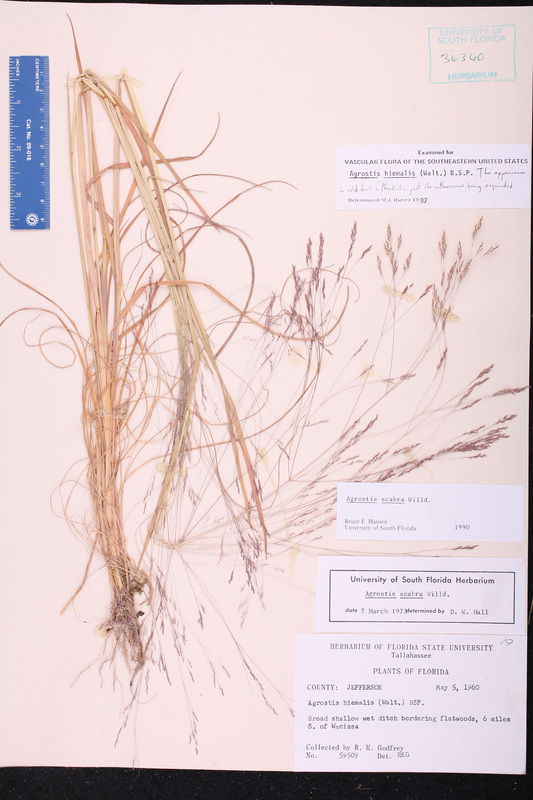 BASIONYM: Agrostis geminata Trinius, forma exaristata Fernald 1933. 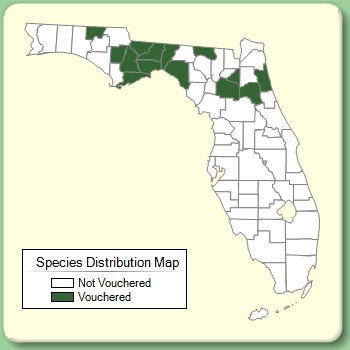 Agrostis hyemalis forma tuckermanii Agrostis hyemalis (Walter) Britton et al., forma tuckermanii (Fernald) Scoggan, Fl. Canada 1: 51. 1978. 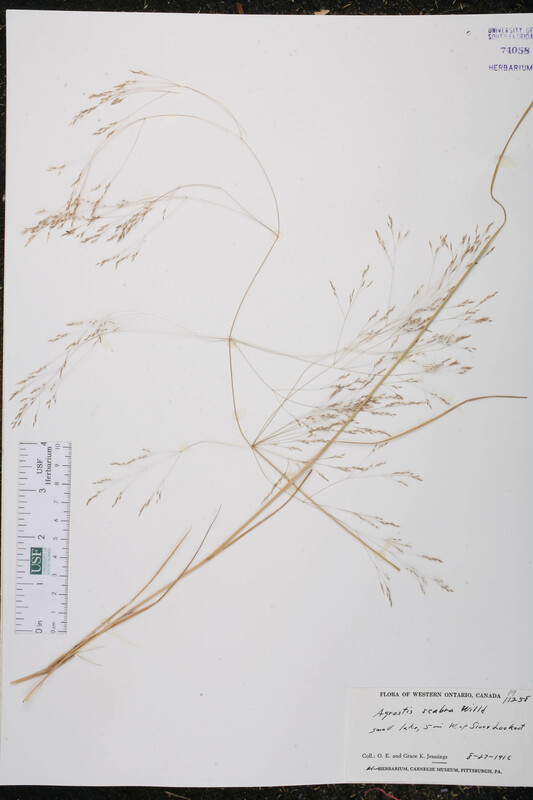 BASIONYM: Agrostis scabra Willdenow, forma tuckermanii Fernald 1933. Agrostis hyemalis var. 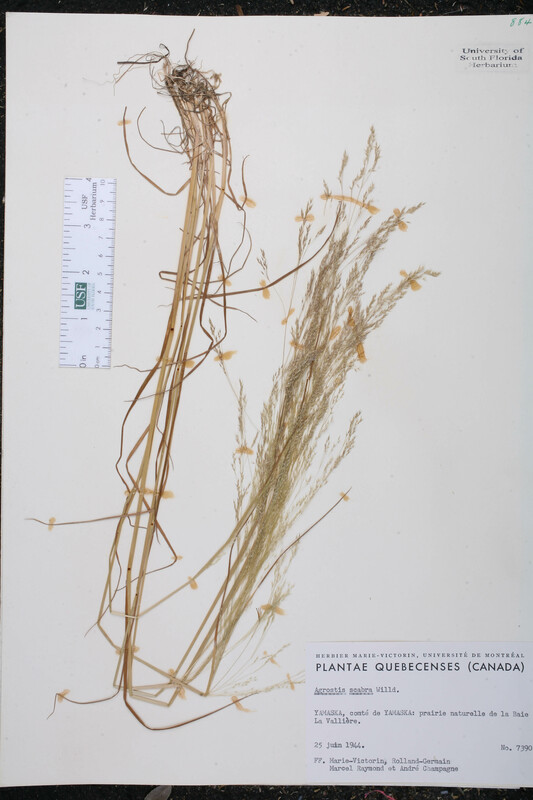 geminata Agrostis hyemalis (Walter) Britton et al., var. geminata (Trinius) Hitchcock, Bull. Bur. Pl. Industr., U.S.D.A. 68: 44. 1905. 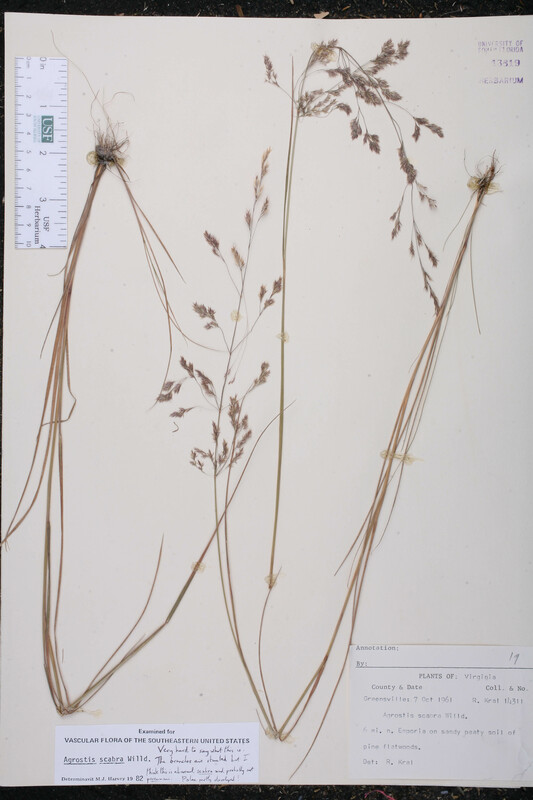 BASIONYM: Agrostis geminata Trinius 1824. Agrostis hyemalis var. 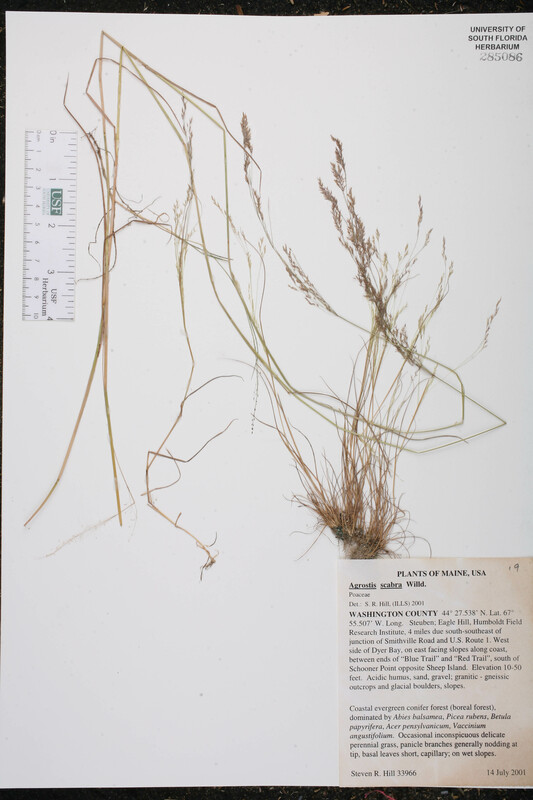 keweenawensis Agrostis hyemalis (Walter) Britton et al., var. keweenawensis Farwell, Rep. Michigan Acad. Sci. 6: 203. 1904. TYPE: MICHIGAN: Keweenaw Co.: Shore of Lake Superior, 1 Jul 1895, Farwell 600c (holotype: BLH). Agrostis hyemalis var. 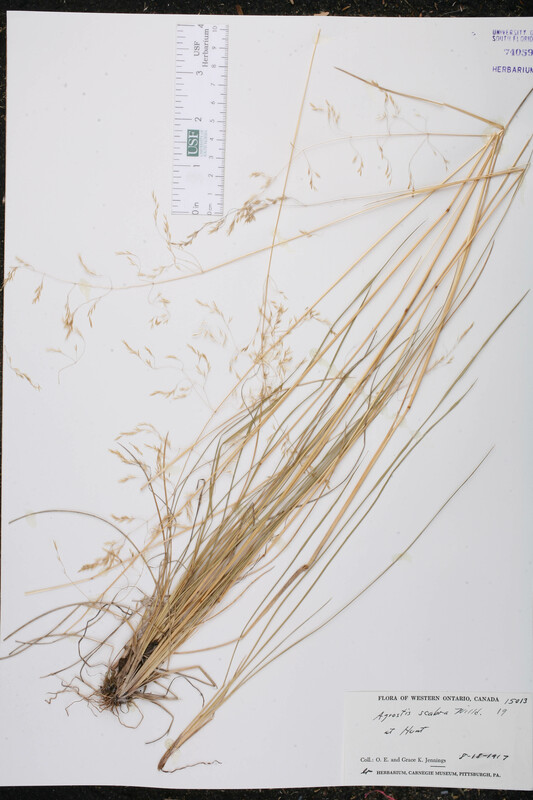 nutkaensis Agrostis hyemalis (Walter) Britton et al., var. nutkaensis (Kunth) Lamson-Scribner & Merrill, Contr. U.S. Natl. Herb. 13: 56. 1910. BASIONYM: Agrostis nutkaensis Kunth 1830; Trichodium album J. Presl 1830. Agrostis hyemalis var. 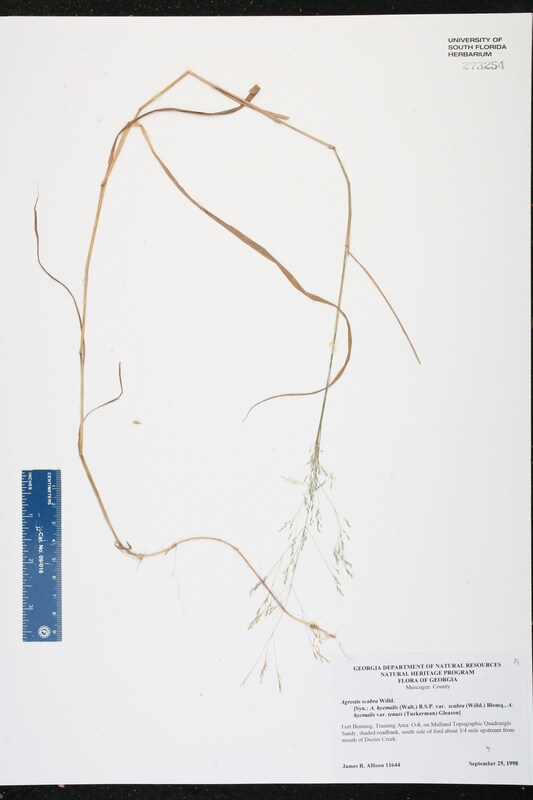 oreophila Agrostis hyemalis (Walter) Britton et al., var. oreophila (Trinius) Farwell, Rep. (Annual) Michigan Acad. Sci. 6: 202. 1904, nom. illegit. 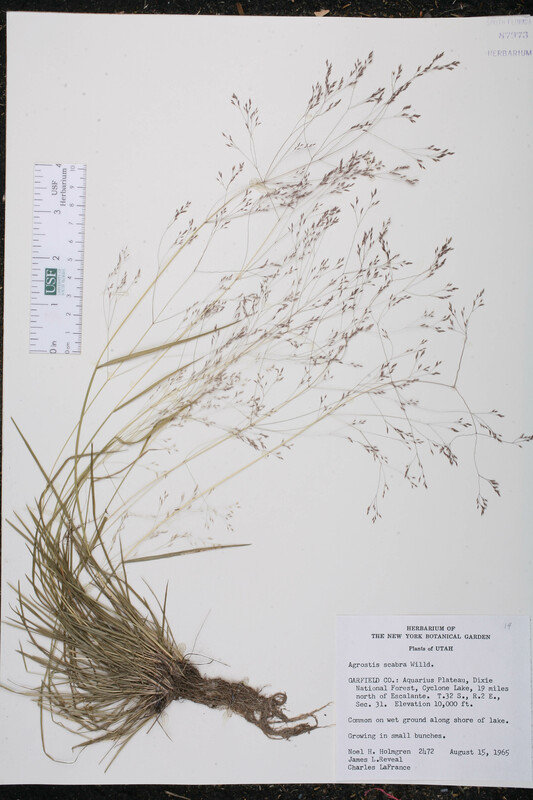 BASIONYM: Agrostis laxiflora Richardson, var. montana (Torrey) Tuckerman 1843; Agrostis oreophila Trinius 1841; Trichodium montanum Torrey 1823. Agrostis hyemalis var. 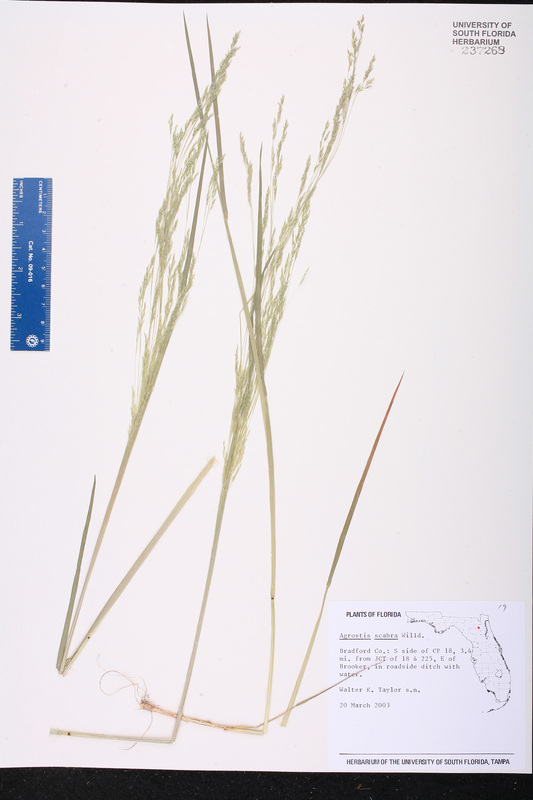 tenuis Agrostis hyemalis (Walter) Britton et al., var. tenuis (Tuckerman) Gleason, Phytologia 4: 21. 1952. 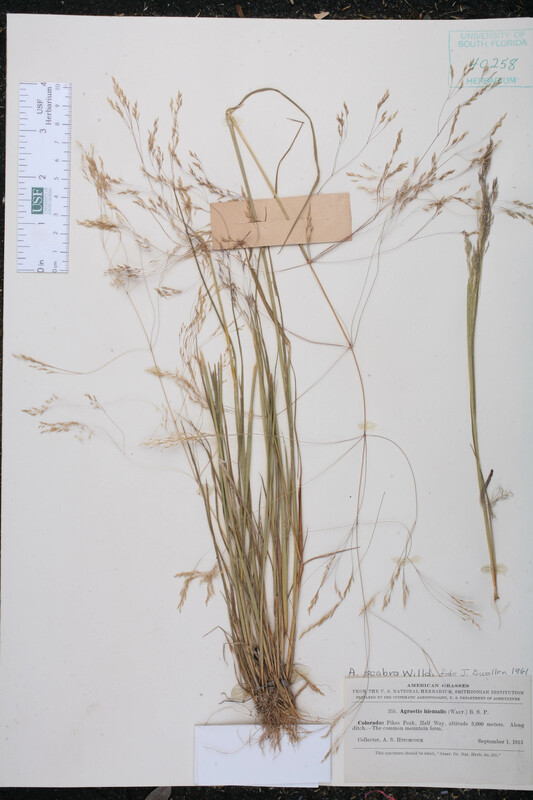 BASIONYM: Agrostis scabra Willdenow, var. tenuis Tuckerman 1843. Agrostis laxiflora var. caespitosa Agrostis laxiflora Richardson, var. caespitosa Torrey, Fl. New York 2: 442. 1843, nom. illegit. 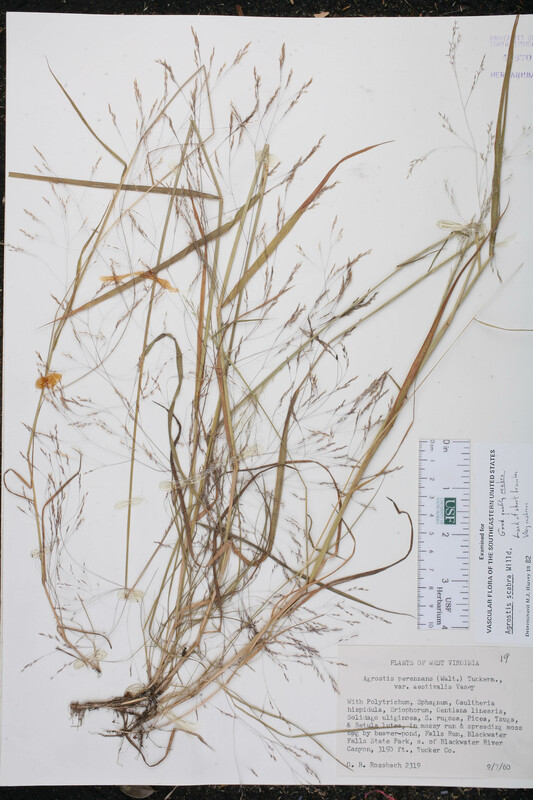 BASIONYM: Agrostis laxiflora Richardson, var. montana (Torrey) Tuckerman 1843; Trichodium montanum Torrey 1823. Agrostis laxiflora var. montana Agrostis laxiflora Richardson, var. montana (Torrey) Tuckerman, Amer. J. Sci. Arts 45: 43. 1843. BASIONYM: Trichodium montanum Torrey 1823. Agrostis laxiflora var. 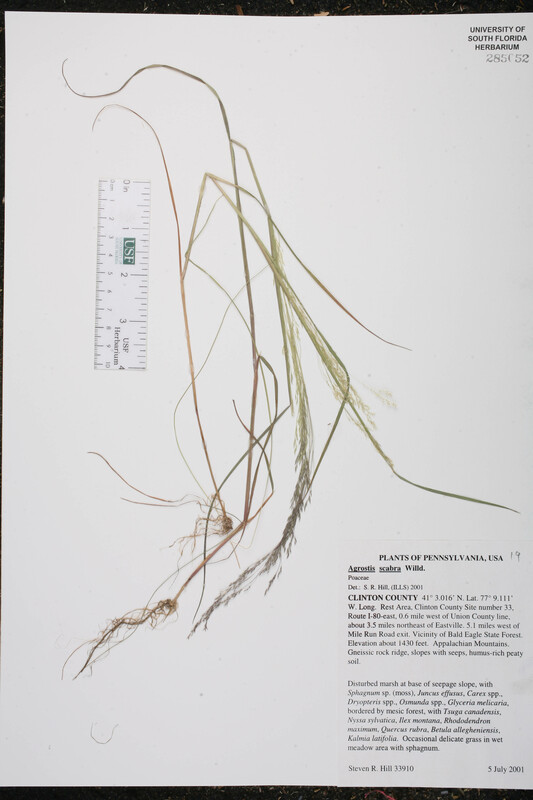 tenuis Agrostis laxiflora Richardson, var. tenuis (Tuckerman) Torrey, Fl. New York 2: 442. 1843. 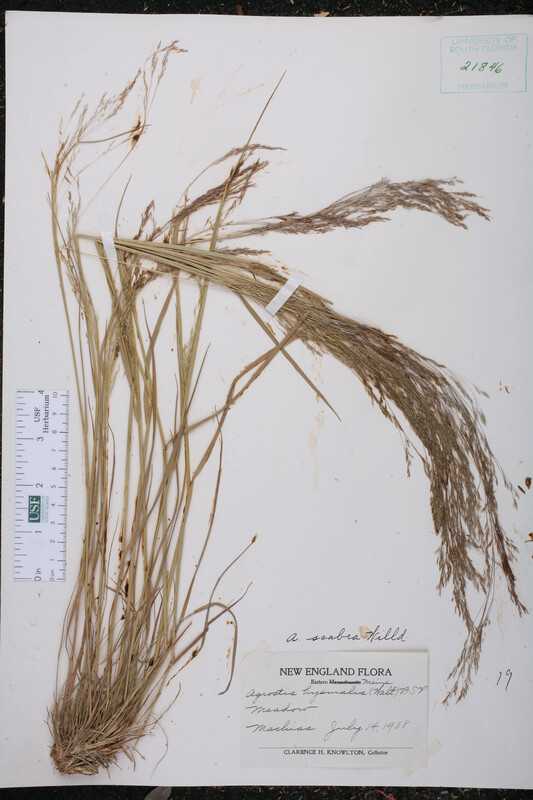 BASIONYM: Agrostis scabra Willdenow, var. tenuis Tuckerman 1843. Agrostis nutkaensis Agrostis nutkaensis Kunth, Revis. Gramin., Suppl. 17. 1830. BASIONYM: Trichodium album J. Presl 1830. 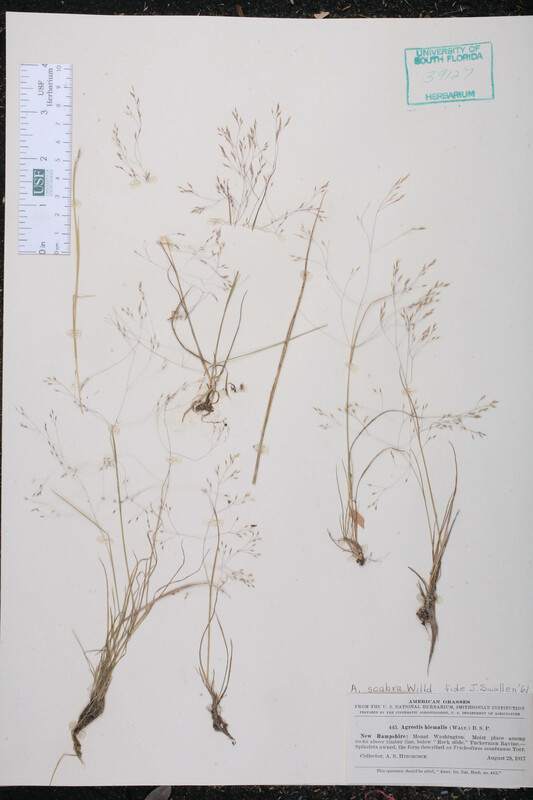 Agrostis oreophila Agrostis oreophila Trinius, Mém. Acad. Imp. Sci. Saint-Pétersbourg, Ser. 6, Sci. Math., Seconde Pt. Sci. Nat. 6: 323. 1841. BASIONYM: Trichodium montanum Torrey 1823. 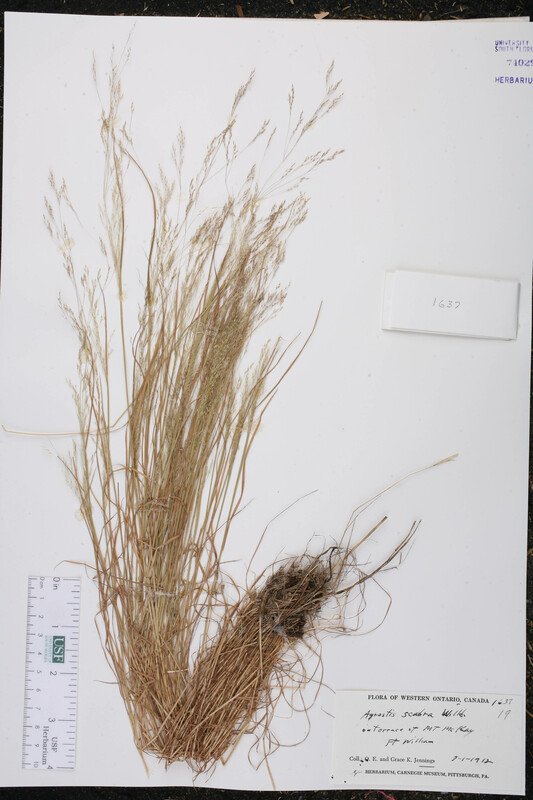 Agrostis peckii Agrostis peckii House, Amer. Midl. Naturalist 7: 126. 1921, nom. illegit. BASIONYM: Agrostis oreophila Trinius 1841; Trichodium montanum Torrey 1823. Agrostis scabra forma exaristata Agrostis scabra Willdenow, forma exaristata (Fernald) Hultén, Acta Univ. Lund 38: 156. 1942. 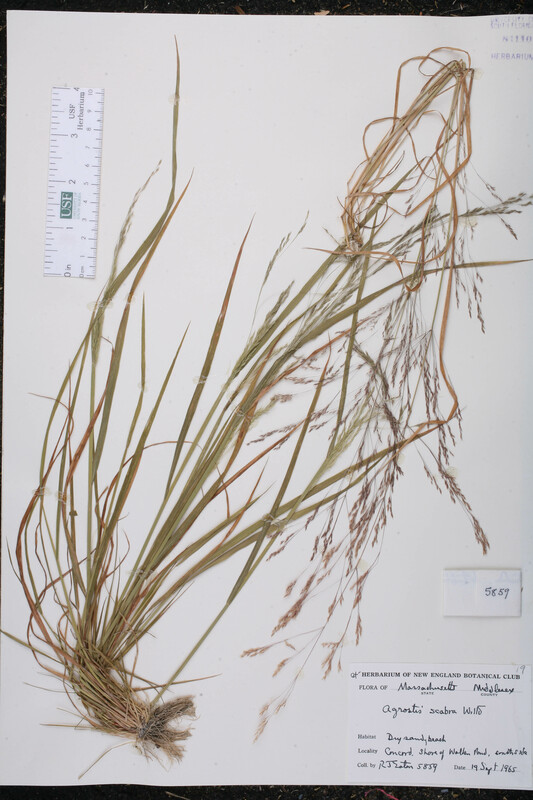 BASIONYM: Agrostis geminata Trinius, forma exaristata Fernald 1933. Agrostis scabra forma setigera Agrostis scabra Willdenow, forma setigera Fernald, Rhodora 35: 210. 1933. TYPE: CANADA: Newfoundland: Near Sand Bank, W of Burgeo, 9 Sep 1926, Fernald et al. 79 (holotype: GH). Agrostis scabra forma tuckermanii Agrostis scabra Willdenow, forma tuckermanii Fernald, Rhodora 35: 207. 1933. TYPE: MASSACHUSETTS: Norfolk Co.: Monatiquoit River above Union Street, Braintree, 1 Jul 1911, Churchill s.n. (holotype: GH). Agrostis scabra subsp. 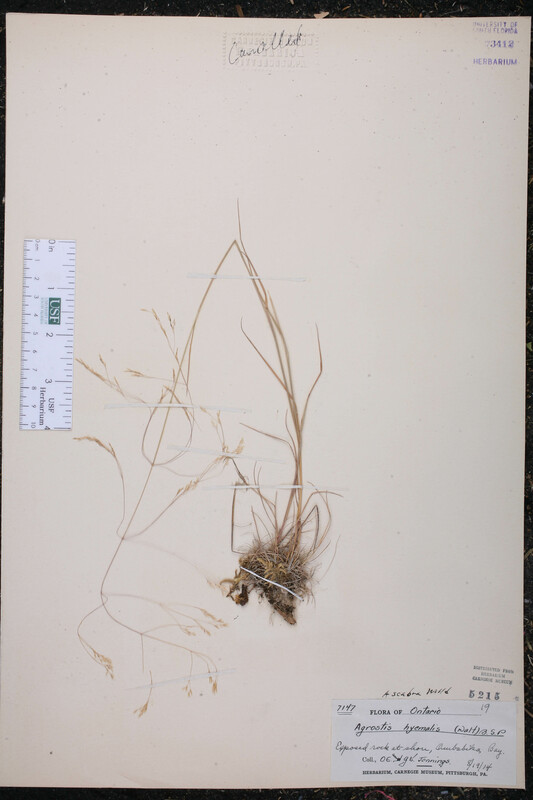 septentrionalis Agrostis scabra Willdenow, subsp. septentrionalis (Fernald) Á. Löve & D. Löve, Bot. Not. 128: 504. 1976 ("1975"). 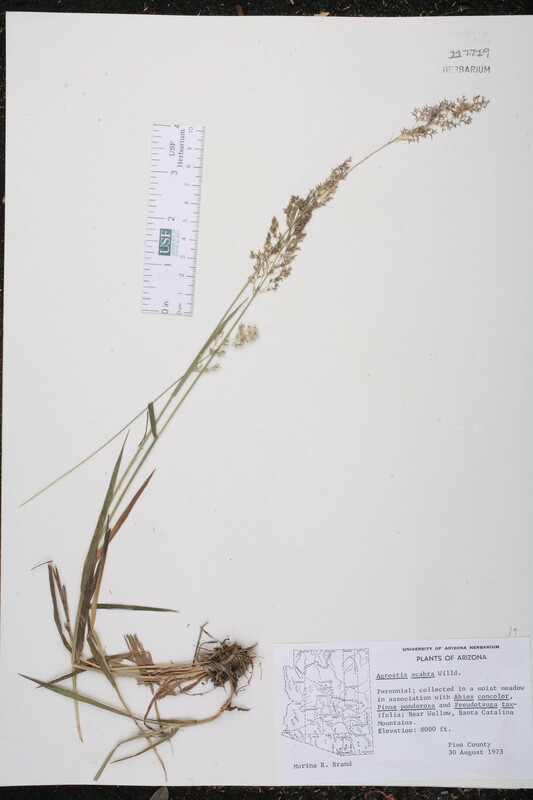 BASIONYM: Agrostis scabra Willdenow, var. septentrionalis Fernald 1933. Agrostis scabra var. 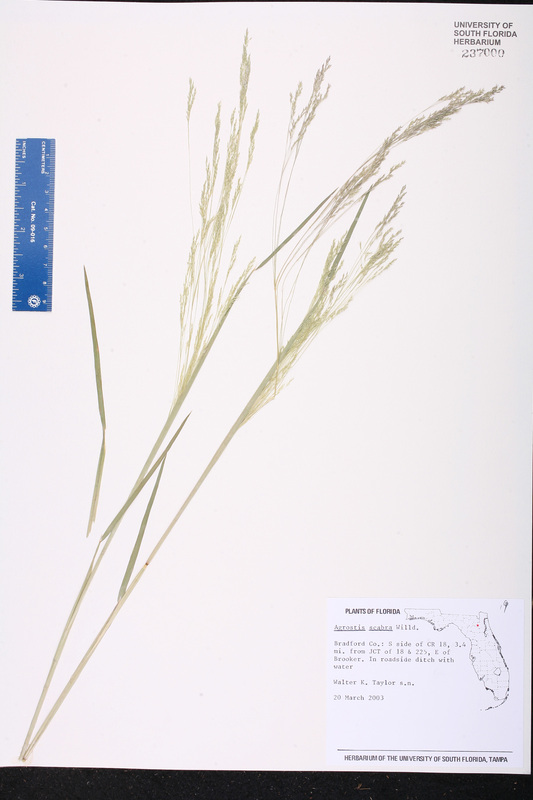 geminata Agrostis scabra Willdenow, var. geminata (Trinius) Swallen, Proc. Biol. Soc. Wash. 54: 45. 1941. 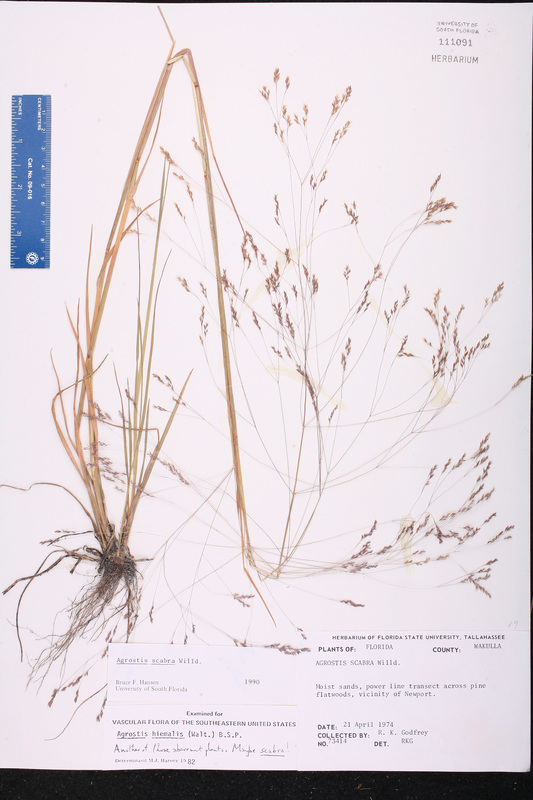 BASIONYM: Agrostis geminata Trinius 1824. Agrostis scabra var. 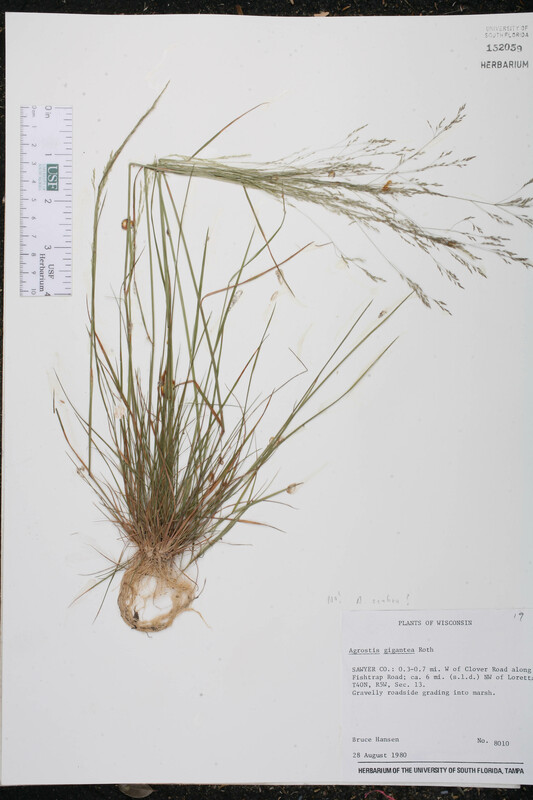 keweenawensis Agrostis scabra Willdenow, var. keweenawensis (Farwell) Farwell, Pap. Michigan Acad. Sci. 23: 125. 1938. 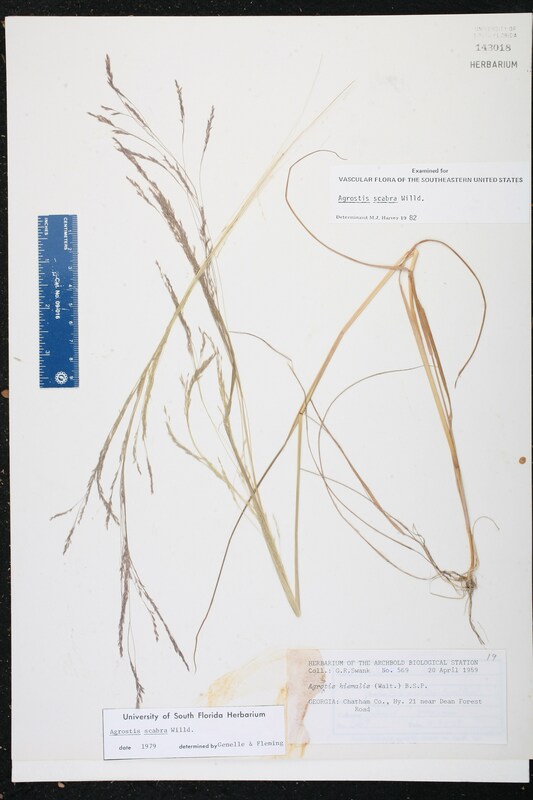 BASIONYM: Agrostis hyemalis (Walter) Britton et al., var. keweenawensis Farwell 1904. Agrostis scabra var. montana Agrostis scabra Willdenow, var. montana (Torrey) Fernald, Proc. Portland Soc. Nat. Hist. 2: 91. 1895. BASIONYM: Trichodium montanum Torrey 1823. Agrostis scabra var. oreophila Agrostis scabra Willdenow, var. oreophila (Trinius) A. W. Wood, Class-Book Bot., ed. 1861. 774. 1861, nom. illegit. 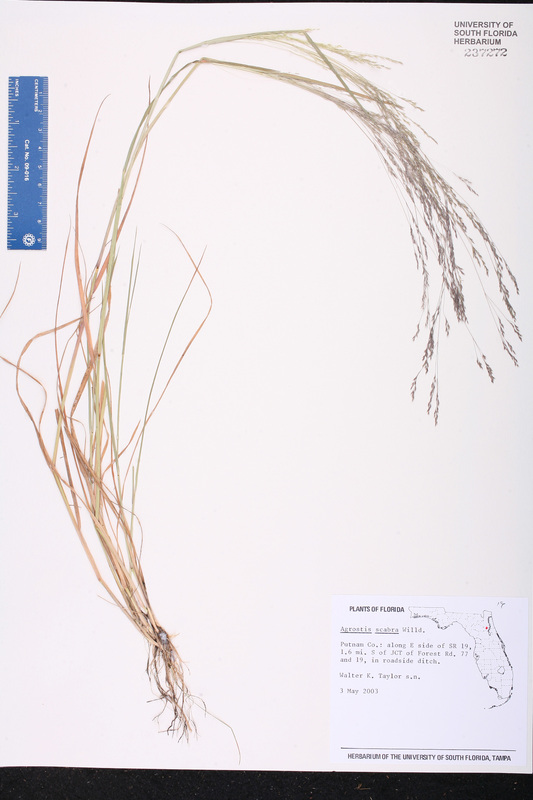 BASIONYM: Agrostis laxiflora Richardson, var. montana (Torrey) Tuckerman 1843; Agrostis oreophila Trinius 1841; Trichodium montanum Torrey 1823. Agrostis scabra var. 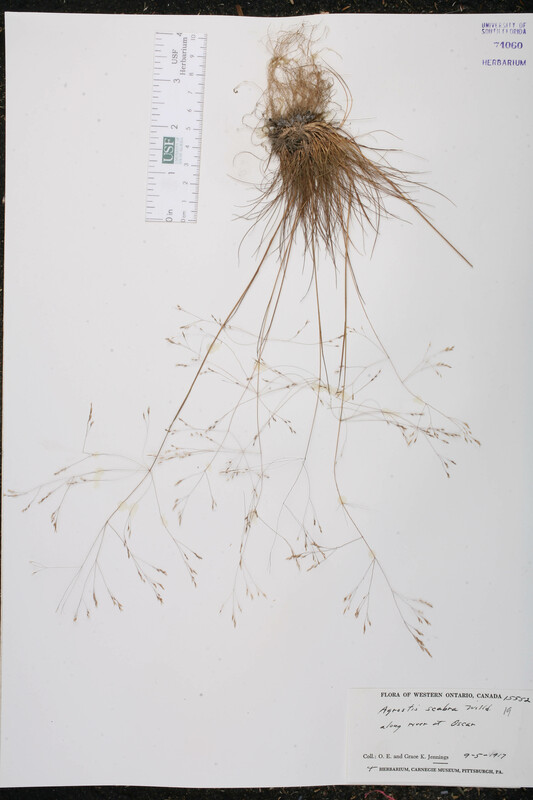 septentrionalis Agrostis scabra Willdenow, var. septentrionalis Fernald, Rhodora 35: 209. 1933. TYPE: CANADA: Newfoundland: Near Winterhouse Brook, Bonne Day, 8 Aug 1929, Fernald et al. 1310 (holotype: GH). Agrostis scabriuscula Agrostis scabriuscula Buckley, Proc. Acad. Nat. Sci. Philadelphia 14: 90. 1862. TYPE: OREGON: "Columbia Plains", without data, Nuttall s.n. (holotype: PH). Agrostis torreyi Agrostis torreyi Tuckerman, Mag. Hort. Bot. 9: 143. 1843, non Kunth 1830. BASIONYM: Trichodium montanum Torrey 1823. Trichodium album Trichodium album J. Presl, in C. Presl, Reliq. Haenk. 1: 244. 1830. TYPE: CANADA: British Columbia: Nootka Sound, Vancouver Island, s.d., Haenke s.n. (holotype: PR?). Trichodium montanum Trichodium montanum Torrey, Fl. N. Middle United States 84. 1823. TYPE: NEW YORK: "Summit of the Fishkill Mts. ", without data, Torrey (?) s.n. (holotype: NY). USA Florida Alachua Co. 15 Mar 2000 W. K. Taylor s.n. USA Florida Bradford Co. 20 Mar 2003 W. K. Taylor s.n. Sheet 1 of 2. USA Florida Bradford Co. 20 Mar 2003 W. K. Taylor s.n. Sheet 2 of 2. USA Florida Putnam Co. 03 May 2003 W. K. Taylor s.n. USA Arizona Coconino Co. 11 Sep 1982 K. Zerba s.n. USA Maine 14 Jul 1908 C. H. Knowlton s.n. USA Arizona 30 Aug 1973 M. R. Brand s.n.